Ganbare Goemon! Karakuri Douchuu (がんばれゴエモン！からくり道中, Ganbare Goemon! Karakuri Douchuu? lit. Persevere Goemon! A tricky journey) is a video game produced by Konami. It is the second game in the Ganbare Goemon series (known as the Legend of the Mystical Ninja series in North America and Europe) and the first released on a video game console and home computer. It was initially released for the Famicom in 1986 and later released for the MSX2 one year later. The Famicom version was re-released in Japan only for the Game Boy Advance under the Famicom Mini label. 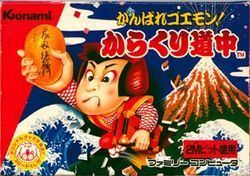 The game revolves around the main character Goemon, and his exploits. As the name suggests, his character was based on Ishikawa Goemon, the noble thief of Japanese Folklore. Unlike its sequels, this game still doesn't features the comic situation and strange characters that define the series, and Goemon is portrayed as a noble thief rather than a plain hero. The game plays as a top-view action-adventure game (similar to the Legend of Zelda) though it is separated by stages. In each level Goemon must find three passes in order to advance. Some of these passes are found in boxes, secret passages or can be bought. Like the rest of the series, Goemon can be powered up if certain items are found and/or bought, which can be lost after a few hits. The MSX2 version features crisper graphics, but presents each screen as a static scene instead of scrolling them horizontally. It has the option to be played by turns by two players, with the second player playing as a ninja named Nezumi Kozō, which is the basis of Goemon's sidekick Ebisumaru. In addition, unlike the Famicom version, the game has 6 more provinces with completely new levels after finishing the game once. The peasants and commonfolk of Japan are suffering from corrupt officials and insane taxes! With no relief in sight, Ishikawa Goemon takes justice in his own hands, and starts a spree of robberies to steal back the wrongly taken money. Despite earning the title of "The Great Thief of Edo", Goemon's efforts on the street are not enough to stop the suffering. Suspecting something fishy at the Feudal Lord's castle, Goemon decides to go confront the Lord himself and put an end to the corruption.